Easy-to-customize personalized web pages at Imikimi.com now have the ability to embed multiple slide shows of user photos and personalized graphics, as well as multiple YouTube videos. Slide shows of photos and personalized graphics can now be easily created and embedded in Imikimi.com custom "Kimi Pages", the web's easiest way to make graphic-rich personalized web pages. 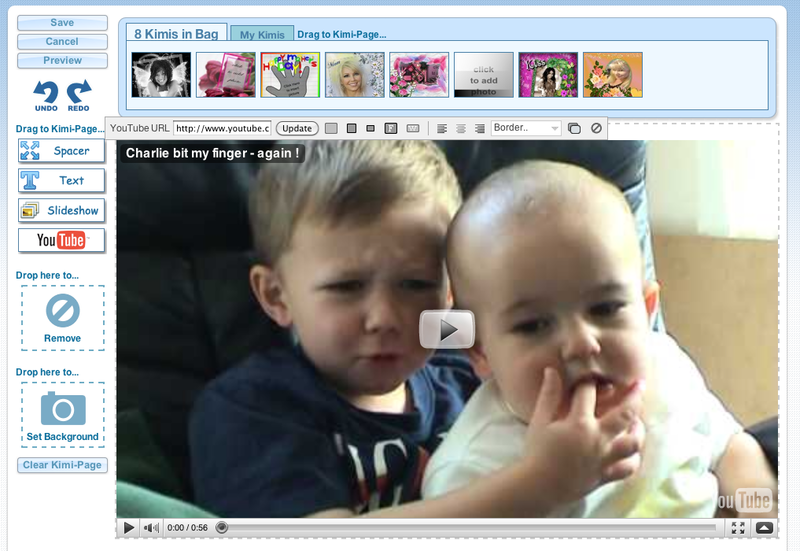 In addition, users may now embed multiple YouTube videos on their personal Kimi Pages. Imikimi Kimi Pages provide tools for users to quickly and easily create high-quality personal web pages from modules including photos, personalized graphics, text, custom backgrounds, slideshows, and YouTube videos. Users can put their photos in nearly two million graphic templates called "Kimi Frames", with one for every possible taste and occasion. Imikimi users can easily size and fit their personal photos from Facebook, cameras, and photo libraries into a perfect photo template. The resulting graphics can be posted and tagged on Facebook, MySpace and other social media, as well as e-mailed or printed. Users are not limited to a single web-page. They can create a special web page for every occasion and purpose, including events like weddings, birthdays, and anniversaries, as well as special holidays and family gatherings. Users also create pages just to share their own photos and interests, as well as sharing with all of their friends. Romance is always a popular topic. features with a burst of creativity. Themoonprincess' Kimi Page incorporates videos she made of her artwork. Margarita2007's Kimi Page uses the new slideshows to great effect. CorolinaMel's Kimi Page shows off her great collection of holiday-themed custom graphics. "We want to bring fun and simple tools for sharing creativity to everyone on the web, wherever they are," says Shane Brinkman-Davis, Co-Founder and CTO of Imikimi. Imikimi.com is a global online community for sharing creativity where millions of people create, re-mix and collaborate on digital images in a fun and easy way. Imikimi artists have created 1,753,835 original photo frame templates cards for every possible use, with hundreds being created every day. Photo frames are available for every imaginable purpose, occasion, and taste. With great tools for browsing and searching, it’s easy to find the perfect frame for photos of friends, family, kids, and special occasions. Imikimi users have uploaded a quarter-billion photos into them. YouTube Kimi-Page ModuleIt's easy to add, position, and size YouTube videos with the new module for Imikimi.com's Kimi-Pages. Kimi Page Slideshow ModuleKimi-Page Slideshow modules make it easy to share slideshows of artwork created on Imikimi.com.